I have a thing for film noir, and Lauren Bacall and Humphrey Bogart never disappoint! 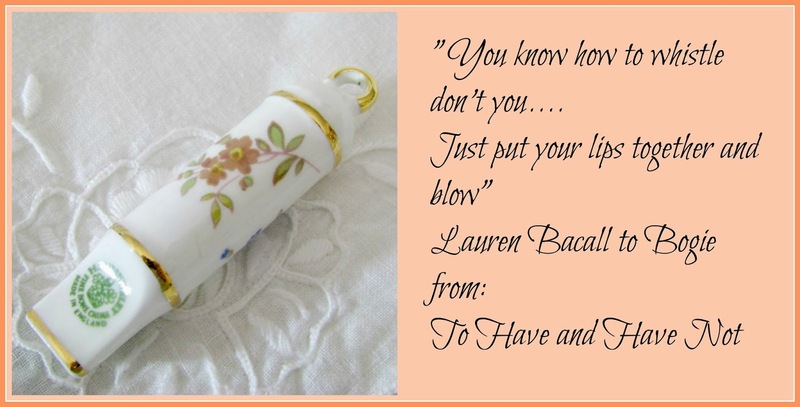 If you don't know how to whistle, consider this fine bone china whistle from Cottage Violet's. R.I.P Lauren Bacall 1924-2014 You were definitely one of kind! 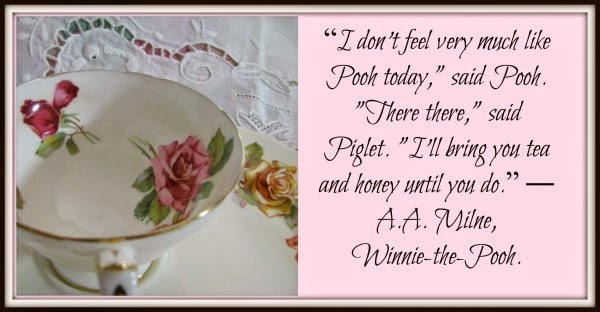 Always bring me tea in your finest English china cup and saucer. The feel of the tea cup makes me feel better! I am in the midst of a linen bombshell. A whole trunk of linens exploded all over the living room floor. Well, to be honest it looks like they exploded, but I put them there, yes, I did it. What was I thinking? I knew this was going to be a huge task. A big wooden trunk of linens left over from the 1980's antique store called Manya's. My mom and I had a room there called , Marie Therese'. Do you remember the 80's? 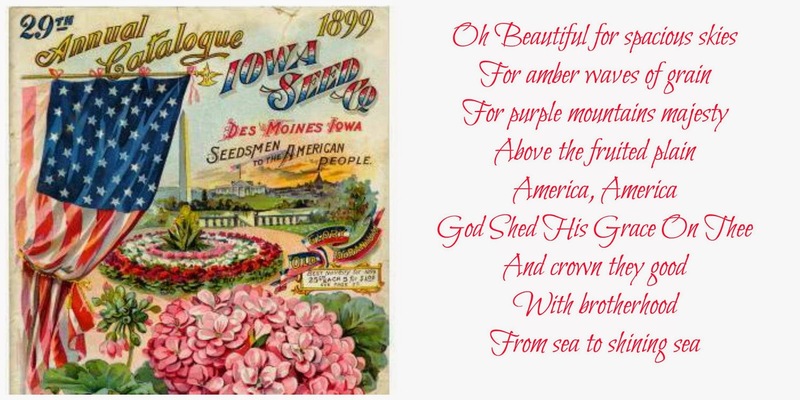 Everything collectible for your hearth and home was selling like wildfire. The internet was in it's toddler years, so everyone travelled to the antique shops and sidewalk sales. H Street had a big following from L.A. and all points west. We couldn't keep linens on hand, so I searched high and low, and gathered a great huge amount. Sadly, we had to give up our room and I put the linens in a wooden trunk. I'd earn the trunk painting crafts for my sister-in-laws craft fair business (craft fairs were big then too). So here I am, washing, and soon to be ironing. Then the picture taking and listing begin. Tally Ho, onward and upward! 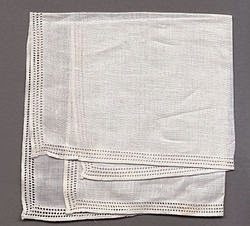 Cottage Violet's will soon have linens added to the linen category as well as the crocheted dish cloths and potholders. One wonders if this was a happy quote or unhappy quote. What do you think? Perhaps it is a matter of fact statement about the rigors of childbearing. 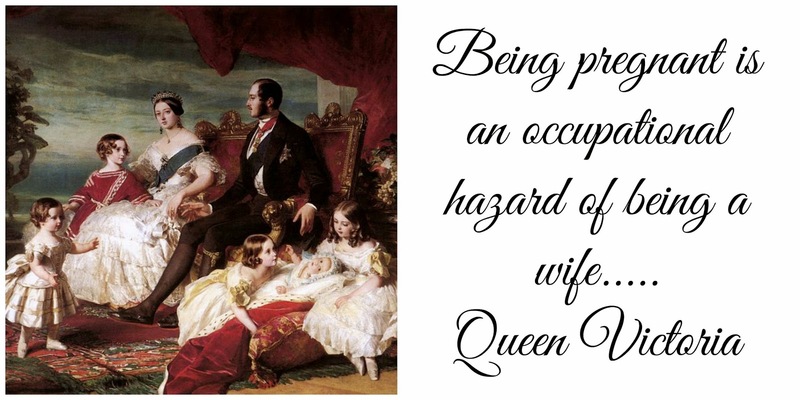 What were you thinking Queen Victoria? Inquiring minds want to know. Sometimes I want something sweet, even though I have given up sugar for the time being. It's hard to wade through summer's celebrations without indulging once in awhile. It's nice that carb cravings subside when sugar is forsaken, I like that part. But, the soul thirsts for a treat and tells the mind, "Get me something now or regret it". 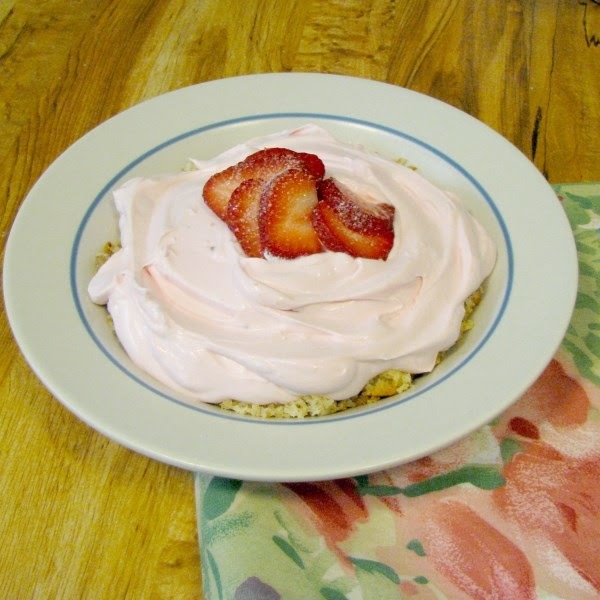 This Strawberry Yogurt Pie doesn't qualify for the Atkins type lo carb. However, it helps me navigate through the dessert grenades lobbed my way. It's simple. I crumble 2 sugar free cookies in a dish. (The dish I used was a flat rimmed soup bowl from my everyday dinnerware). I used cookies from this recipe .Thank you, All Day I Dream About Food, an excellent lo carb blog. 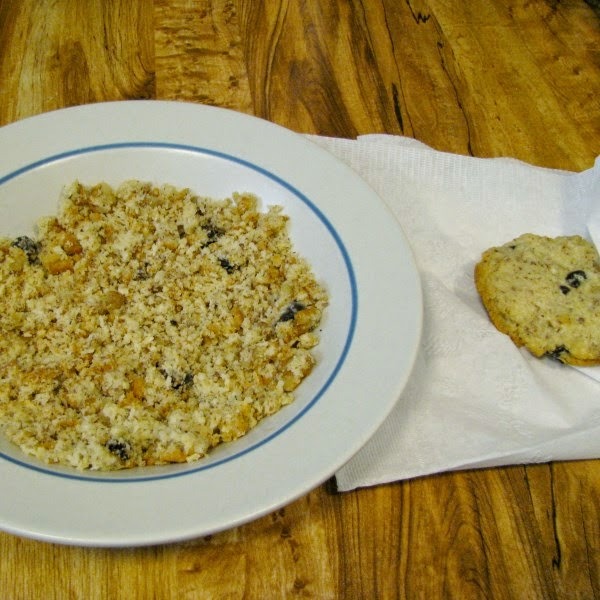 You can use any sugar free cookie, store bought work well also. You'll notice I have a cookie for myself, as a reward for being such a good wife! 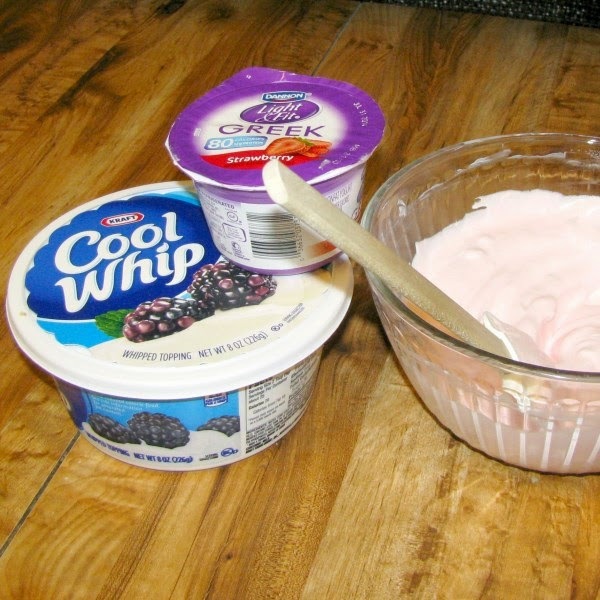 In a medium bowl I mix a container of 80 calorie strawberry yogurt and approximately 1/3 container of Sugar Free Cool Whip. I fold it over and over to get out any lumps from the greek yogurt I prefer. Then I spoon the yogurt mixture over the cookie crumbs. I slice a strawberry and put it on top, and sprinkle the strawberry with a little splenda. I refrigerate the pie for a few hours, it holds up nicely. It makes 4 servings of yummy pie at 140 sugar free calories per serving. The only problem is my husband can't wait and eats two servings, then wants mine. Life is not perfect, but it is good, really good. This yogurt pie is good too, really good! 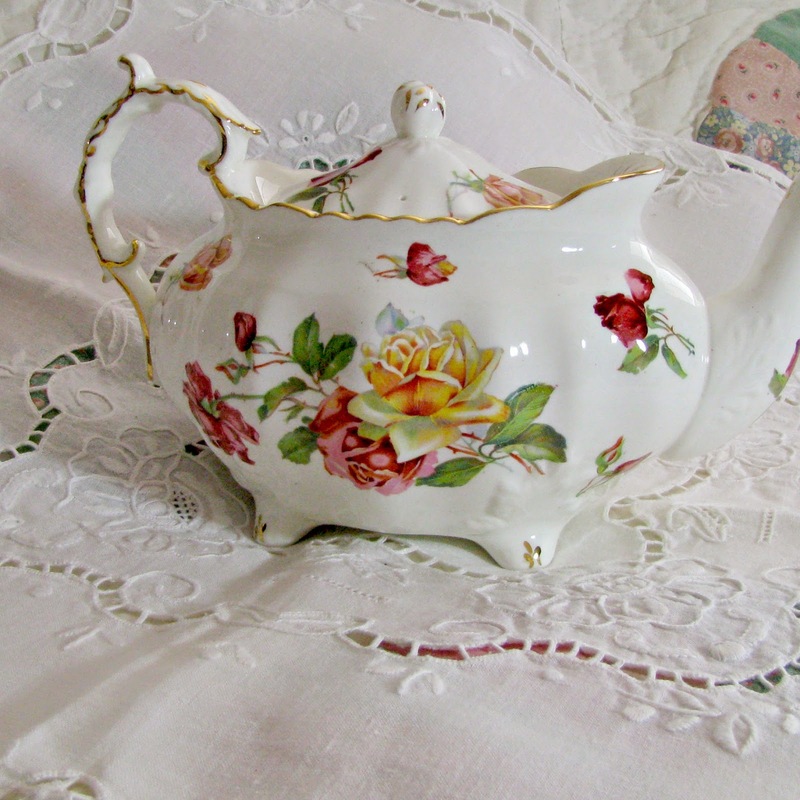 Sometimes Monday is just the perfect day to put the kettle on, and get out your favorite teapot. 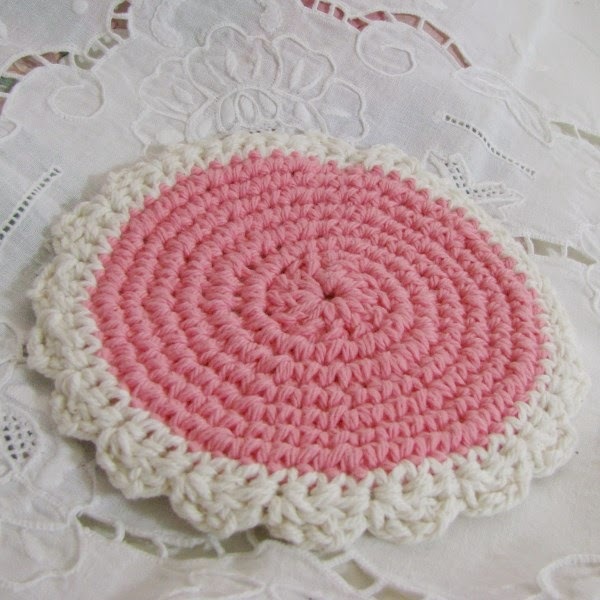 Get out a pretty little trivet to set the teapot on. I hand crochet ours at Cottage Violet's. Choose your loveliest teacup. 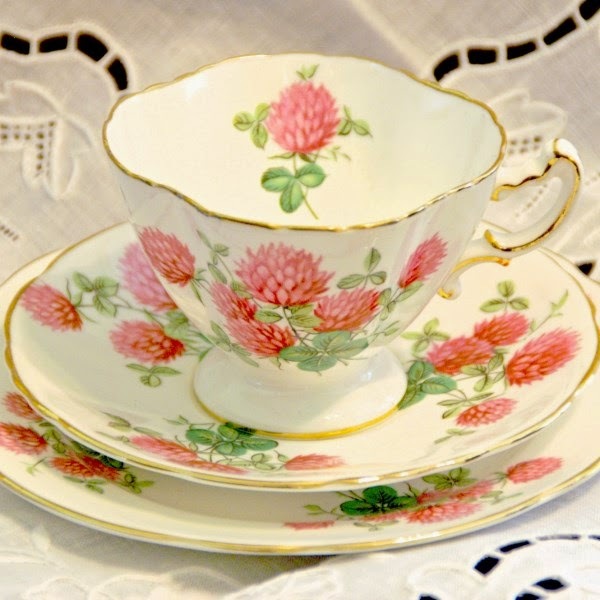 This Hammersley Clover Trio ranks high on my list. Remember you are treating yourself. You must have a coaster to set your teacup on. 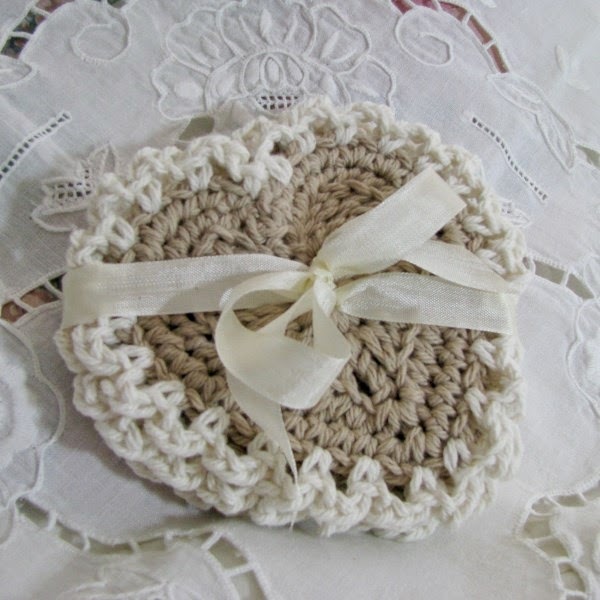 I love little crocheted heart coasters. They make me very happy. Now get out your knitting or crochet bag and settle in for a day of pure enjoyment.